If Persecution Was Legal Would You Still Be a Christian? Home Outreach Leaders Articles for Outreach & Missions If Persecution Was Legal Would You Still Be a Christian? For the majority of the world, to become a Christian is at best a difficult life, and in many cases it’s life threatening. Jesus not only gave His disciples a commission, but He likewise warned them of the danger that was ahead. Suppose that open persecution was legalized in your city, would you still be a Christian? Before you begin a response to me regarding the fine points of theology, I want you to know that I’ve crafted the question in a specific way on purpose. Would your fear of man override your fear of God? Would your love for prosperity and peace be more valuable than the treasure of Christ? It may come as a shock, but each year thousands of Christians are losing their lives because of their relationship to Jesus Christ. Some statistics report as many as 100,000 per year die for their faith in Christ. Other statistics report numbers as low as 7,000-8,000. No matter what number is right, the point is clear, it’s not a safe world for Christians. What if you were arrested and imprisoned simply for having a Bible app on your phone or for attending worship on Sunday? Would you continue in your faith or would you save your life by denying Christ? In many cases in the United States, a little rain or a better opportunity that’s presented in form of recreation will keep families away from the gathered church for worship. That’s the current climate beneath the umbrella of prosperity and freedom. What if you lived beneath the intense pressures of Christian persecution, as many do around the world? Would you still be a Christian? If the fear of death or the love of pleasure is of greater value than the treasure of Christ, you never possessed real Christianity in the first place. If you choose the world over Jesus, your faith is false (1 John 2:19). John 15:19—If you were of the world, the world would love you as its own; but because you are not of the world, but I chose you out of the world, therefore the world hates you. Christians are called to suffer, and to suffer for the proper reasons. Jesus promised that His followers would suffer persecution (Luke 21:17). At one point, Jesus said, “Blessed are those who are persecuted for righteousness’ sake, for theirs is the kingdom of heaven” (Matt. 5:10). Not only did Jesus promise persecution for His followers, but He encouraged them to be persecuted for righteousness’ sake. It is possible for real Christians to suffer persecution for the wrong reasons. Experiencing persecution for foolish choices or for sinful motives is not the same as suffering for righteousness’ sake. Jesus understood the difference as did the apostles (1 Peter 3:1). Christians can suffer for making poor choices that lead to suffering when it’s not absolutely necessary. We must be reminded that there are hills worthy of death, but not all hills are as valuable as others. When Peter and the other apostles were arrested for preaching Christ, they were beaten and charged not to preach in the name of Christ again. The word “beat” used in Acts 5:40 means “strike or whip as to take off the skin.” This was a severe warning as opposed to death, which is what the religious leaders wanted to do to them. However, Peter and the apostles were resolved to continue preaching Christ. They feared God more than men. The fear of death or severe punishment often reveals false Christians. In the 1970s, an illegal Bible study was being conducted in Asia. When Communist officials discovered the meeting, they sent soldiers to shut it down. The soldiers burst into the room, and confronted the pastor and small congregation. They demanded the pastor to hand over his Bible. The solider threw it on the ground and then stated that they could all leave, under one condition. Each member had to spit on the Bible, which the solider called a “book of lies.” As they called on individuals to come forward, they spat upon the Bible as directed and they were immediately released. When a young teenager was called upon, she approached the Word of God, knelt down and wiped off the Bible with her dress. The Communist solider put his pistol to her head and pulled the trigger. When John Rogers finished his translation work and had the Matthew Bible printed and distributed, he was later arrested for his views on the Lord’s Supper. When he refused to accept the doctrine of the Roman Catholic mass (the doctrine of transubstantiation), he was burned at the stake in 1555 in front of his entire family and others in the streets. Real Christians are prepared to suffer and die for their faith, but false Christians renounce Christ out of their fear of man and the prospect of pain. The initial question was purposely crafted in a way to make you think. 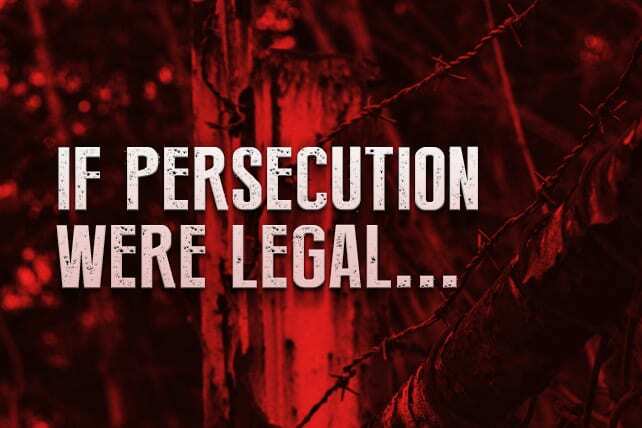 If persecution was legal, would you still be a Christian? All true Christians continue to the end, even beneath the pressures of persecution. As Justin Martyr famously stated, “They can kill us, but they can’t hurt us.” Is your Christianity shallow, weak and false? In an evangelical climate where sports can actually compete with Jesus, the local church is placed down the list of priorities, and doctrine is downplayed—do we expect such professing Christians to die for their faith? Would you be a Christian if persecution was legal? Luke 9:24—For whoever would save his life will lose it, but whoever loses his life for my sake will save it. Sinclair Ferguson, The Sermon on the Mount, (Carlisle PA: Banner of Truth, 1997), 41. For more information on the persecution of Christians worldwide, visit Persecution.com.